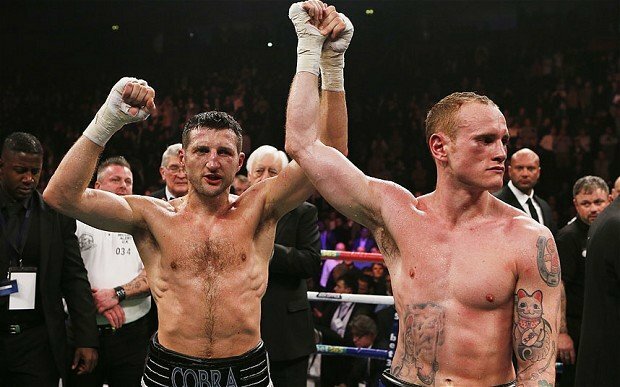 George Groves has reiterated his desire to fight Carl Froch again, the Londoner is confident he will get his rematch with the the 36-year-old. Froch managed to hold on to his IBF championship belt in a classic fight with Groves and won a by knockout which has been seen by most as a premature stoppage by the referee, since then the 25-year-old has campaigned for a rematch and feels the decision was total unjust. Groves feels that the only way to sort out premature knockout decision is to do battle again to find out who is true winner of these two warriors, one thing is for sure their first fight was an all out war and second fight if it’s go ahead with be just as good, if not better. ‘The Cobra’ endured some heavy punishment in that fight, Froch was on the canvas for the first time in his career and Groves did everything he said he would do apart from getting the victory. Groves landed some big shots that night and how the Nottingham fighter withstood that punishment, he would only know…. Any other fighter wouldn’t have been to continue. Speaking about the possibility of a rematch, George Groves said: “Like a lot of fights, it appears to be very close but until it’s in your hands, it’s never close enough. The vibes I’m getting from Carl Froch’s camp is that they desperately don’t want it and keep talking about other options. “Ultimately, I stand firm on my bold claims that he has no option but to fight me. It’s the fight that the fans and the public demand, that the television networks want and it’s the fight that the media in general wants. “I know and I feel a lot of people know why he doesn’t want to fight me, because apart from getting beaten he’ll probably get hurt as well. He embarrassed himself pretty badly in the build-up to the fight and failed to perform. “It was very unsatisfactory. Nobody really feels the fight is finished and it all adds to the feeling that this fight needs to happen again. That’s where I’m at. George Groves and his team have appealed to the IBF in hopes of getting a rematch since Froch’s camp haven’t been forthcoming in arranging a rematch, Groves added: “It was a boxing match. You throw punches, you take punches. I was fully ready and able to continue boxing. I did not need saving. Because of that, the fight should never have been stopped. I was shocked when the referee jumped in. “I was out in New Jersey last week making an appeal to the IBF. I find out the results this week. It was in front of a panel of referees etc. I’m quietly confident. We presented a very good case. Our grounds was bias from the referee and that the finish was unsatisfactory. “Even if it goes against me, the public demand for it is there and it’s what they want to see. The IBF may go against me because he’s an IBF-instated referee. If it doesn’t go my way, I still feel I’ll get my rematch. There’s no other fight out there for Froch – unless he wants to retire, it has to be a fight with me. “Carl, it’s not hard to find me. I’m here at Sky. Come down. We need to get a rematch on. You need to come out and say something other than a pay day and that as champion, you call the shots. You don’t call the shots.